Just a Girl: NOT Halloween! Our entire family (on both sides) lives 2 hours away. If you have family that lives 2 hours away, you know what that means--TRAVEL. Well, a few years ago we put our foot (feet?) down and declared Thanksgiving as the one holiday that we would no longer lug two kids across state. Luckily, our families did not call our bluff, and they ended up driving this way. Who knew? I love earthtones, and this one was right up my alley. It's not quite holiday-ish enough for me, but it's right on track. I'm thinking either pears for the place cards or little gourds. We'll see which one is cheaper. Martha Stewart What are the chances that I'll find a bendable stick in my backyard? Love the colors though. And finally, I have been an avid follower of This Young House for some time now, and they wrote this post just for me. Well, they don't know that, but they did. 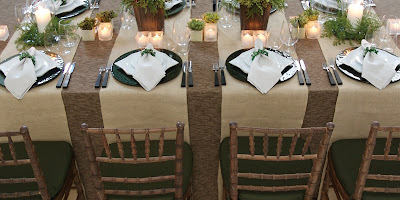 I LOVE green and this tablesetting, and it actually looks like something I could do. Isn't it divine? And look! Someone must have told them that white is my all time favorite color, so they mixed it up a little bit in case I couldn't picture it for myself! How simple, yet how elegant! Well, I'm sure I'll be back with some more thoughts on this, but it's certainly "on the brain" right now. Anything's better than more spooky houses and sparkly witches, right? I loved them all! The first one is such an incredible setting. But, my absolute favorite is the last picture. Oh my - that all-white table setting is so my stlye. I love the one with the white and green too. The punches of green are perfect. 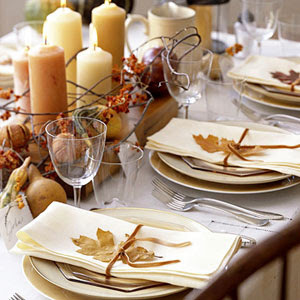 I'm in love with fall and the the warm earthy tones, so a table for Thanksgiving would surely be my favorite choice. Someday (sooner than later) this will be my holiday as my parents are getting ready to hand over the torch. (ugh!!). Please share photos of what you actually end up choosing to do. I love tablescapes. I love table settings! These are so pretty! Can't wait to see what you decide to do! Very cute settings. You could get faux pears and use them year after year. Wow! all of those are beautiful!! A few years ago I got wedgewood blue chargers as a thrift find. A week later found a fall table cloth with the same blue leaves along with green and orange and yellow. Very fallish even with the blue. A week after that I found out I was hosting Thanksgiving. SOMEONE was providing for me even before I knew I needed it! I still love that table the best and once I find a picture I will send it to you!! I love the pear with the name tag...so simple but cute!!! Love the pictures! Oh man! You know how I love table settings. Ummm I love the green and white... wait the brown and cream candle one ... wait the white... oh darn, I love them all. What great pictures. Can't wait to see at Thanksgiving dinner which one you have decided to do. The fun of the anticipation. You will like my post tomorrow. My camera battery is dead. Blast! 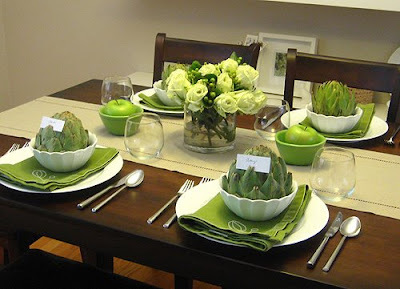 Oooh, love all of them, especially the artichoke place cards! I remember in grade school we had to weave our own baskets, the relevance of this is that we had to soak the reeds in water in order to bend them. Maybe that would work with sticks? The pear place holders are beautiful simplicity. Do it! I totally did the pear thing when I hosted a few years ago. I actually gave my Thanksgiving a theme, "The fruits of the harvest." I'll be posting about it but not until Nov. Thanks for all of the fun table setting ideas! I will be hosting Christmas dinner this year. Those tables are gorgeous. We live three hours away from my family and I can totally relate to the traveling with kids. It is hard! So I am doing Thanksgiving at my house too. It is my first Thanksgiving, so I need to find the perfect table stuff too. I am excited. Thanks for the great ideas! 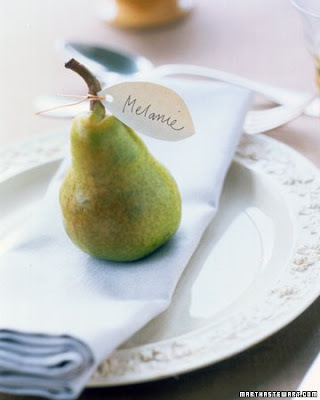 The pear place cards are awesome. Simple and natural yet they make such a statement. I'd go with the pears - they're edible. You'll get your money's worth. Decor and dessert (or at least a snack.) The gourds are cute too, but they'll just be tossed in the end. Good luck and enjoy all the fun planning! You can't go wrong with anything close the any of those tables, but I do love the green table from This Young House. I was IN LOVE with the TYH white on white scape today. Loving it. Last year they had beautiful fake pears at Big Lots for a really good deal. I love the 4th one, but yeah, hard to see across the table. But the colors...so Thanksgivingish. Could you use a mini pumpkin with a name tag? I love the pear but those mini's would be less than 1/2 the price. They have the white striped ones, bumpy ones, etc. Same sort of look, different color. Ok, maybe it's more different than the same! You could get a really low long container, stick in some dry foam and do a short version of all that hot mess with some wheat. GREEN wheat even (since I know you love green) With a wide satin bow hot glued around the container in a deep maroon. Could I write a longer post? Geesh, I need your phone # so I can just call you with all my long winded ideas. I love the second pictures. Visually interesting but not TOO much that it is not functional. My mom and I are trying to figure out our Thanksgiving table setting as well. Have fun! You found some beautiful settings. They are gorgeous! I am kind of jealous that the others could pick favorites. I liked so much from all of them! Thanks for the inspiration, Chris. I, too, am hosting Thanksgiving this year. Should be fun! ok, on the artichokes, i am always so drawn to them, but then i'm all, are my guests going to be all, "um, what do i do with this artichoke?" 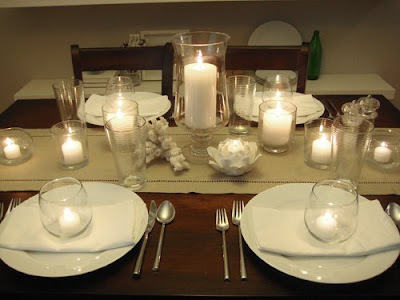 that last setting with the candle on each plate would be awesome any time you're waiting a bit to eat when people come over! the table would look so warm and inviting and i'd be just dying to sit there! I see someone has already suggested soaking the sticks or twigs in water for a couple of hours or even overnight to make them more bendable. I did that with a grapevine wreath and it worked out well for my over-the-door decos for fall. Good Luck - I can't wait to see what you finally come up with. I like the pears for the placecards! Girl, you sooooooooo need to get yourself into your local Target store this weekend (please tell me you have them where you live). They have the most yummy woodsy "holiday" decorations this year. My favorite colors (at the moment) are brown & green, and they have these awesome brown dinner plates w/ these sparkly lt. green votives & off-white accessories (such as a little bird cake stand). Would fit in with all of your wishes! The decorating is the fun part....the cooking, to me...not so much! Good luck! oy. i'm still needing to hit the store for last minute halloween. I can't keep up. But i have to say - LOVE LOVE LOVE the pics. We're the visitors for thxgvg this year - and family isn't arriving until a few days after xmas - but i'm still planning on a fantabulous tablescape - i LOVE that. I always have plans, but they never get executed. I've done Thanksgiving at my home 9 of the 10 years I've been married. This year it is just us - the little ones and my hubs and me. I can't wait to see what you do. Very Pretty!! I love earth tones too, so much you can do with it! You're right, I love those colors. The harvest-y thing is so pretty! I also think the little pears with the nametags are so cute! Can't wait to see your own take on this stuff! Lovely table ideas all of them, but I'm most in love with the one with the grapevine wreath (bendable stick).... How pretty it is. I might need to steal this idea for my table. I am looking for ideas for decorating a buffet table for a Ladies' Night Out coming up in November. I came across a couple of these same photos when Googling for ideas the other day. If you know of anything that might work for me, I would love to hear from you! Thanks! What a blessing that you have your family to come to your house for Thanksgiving. Here it's just my husband, me and my little boy. Anyhow, I love the first photo. I am a earthtone color kinda gal. Okay Chris, you have to let me know that you got this comment because I want to be sure you get this web address. A friend recently brought this one to my attention and I know you will love it after reading your post today. Ready??? 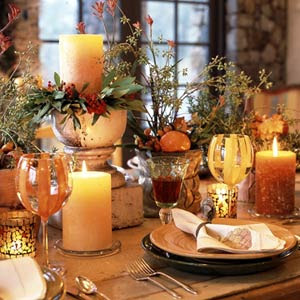 I love all of the table settings but the warm fall colors one that is the most busy is my fav. Not that I like busy, but I just love that setting. Good luck, and I am sure whatever you decide will be perfect! Thank you. No really, thank you for not giving up on me. I'm such a dolt for not listing my blog in my profile. Good golly. Thanks for helping me to figure that out. I fixed it and totally appreciate you helping me figure that out. You're a total peach! And, love the tablescapes by the way. I wish you had posted them two weeks ago when I hosted Canadian Thanksgiving at my house. I guess this whole homemaker thing is still way too new to me bc I never thought that I could search for tablescapes myself. Wow. :) Thanks again Chris!! Hi, Chris, those are pretty tables. This Young House does has come fun inspiration going on. 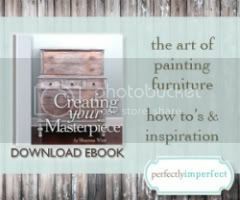 Love your idea to stick with earth tones! Hi Chris, Thank you so much for the comment. Your thanksgiving looks like it will be a lovely one! P.S. At Pier 1 Imports they have fake pears for a dollar, so I am guessing that in the american stores it will be much cheaper! holy yikes, those are some monster artichokes!! Hope you post some photos of how yours turns out. Oooh. Some great table inspiration. Plus you are starting early with your ideas. Good on ya! I want to put a bunch of sticks (bendy and not) in our chandy for the holidays. Thanks for all the inspiration. These are the very things on my mind now too. I always have Thanksgiving at my house and can't wait to find just the right color scheme. I think they are all fantastic! However... the first one really caught my eye. I am always so afraid my guests won't be able to see over my centerpiece, so I definitely think you are smart to consider the conversation aspect at the table. I am sure whatever you do will be great. How many people do you expect? Just wondering how many tables you would have to set. Wow. I hope they all appreciate the lengths you go through to make them feel special. Good Luck!